It constantly amazes me how older bands can simply up and jump right back into the music with little or no problems. In fact, sometimes the old guard is what keeps the new guys in their place. You know, so there aren't any egos being thrown around the industry. 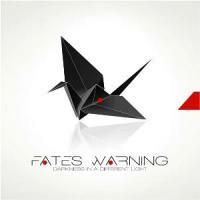 Fates Warning is back after taking a good nine year break between albums. That is a large hunk of time, but I honestly don't see the strain of that upon this album. Fates Warning's Ray Alder (Redemption's vocalist, also) is still in action here with a great vocal performance. He does sound a bit tired, I'll admit. I mean, he's getting old, so what can we expect? But his voice is still rich and emotional. So, this isn't the performance of his career, but it certainly is respectable. I think this is generally the case for the entire band, to be honest. These guys don't really need to come out with some innovative new style that will knock our socks off: No, they can simply come out to give us a solid record, and everyone will love it! You know, because it's Fates Warning, and all. Therefore, this album is great, but no masterpiece. It is a solid rocker that features all of Fates Warning's old tricks, but it doesn't try anything new. For a young band, this would be a problem. For veterans, it's just fine. This ultimately means that we still get the ever-so-silky- smooth rhythm guitars that have a satisfying darkness and complexity to them. We get soulful solos that seem catchy and without much attempt at showboating. It means that the music is complex, yes; but it is also simply enjoyable and immersive. There is a new drummer in town, however. Bobby J. is an excellent drummer that I think uplifts the style of the band in much the same way the younger generation revitalized Evergrey a few years back. Fills are stunningly performed, bass beats are complex and really catchy, and the overall feel really adds to the music instead of trying to compete for the spotlight. The very first track, One Thousand Fires, is especially where Bobby shines as he lets his feet do the talking with some very creative and technically difficult blast beats. Fates Warning isn't all about prog metal, though. There are a couple ballads on the record, and even some very proggy ones that go through several different atmospheres before emerging again in a metal piece. Fates Warning is also about excellent lyrics, and I feel they upheld that here, too. The lyrics seem to be about a desire to be light in the world, but instead finding darkness in yourself and in others. It is about pain and hope. Law and grace. Darkness and light. I still have to figure them out a bit more, but I think this a decent summary. So, Fates Warning is back, and just as good as ever. The music is still excellent with a good boost from new blood, and the overall album is perfectly solid and really enjoyable. It will get stuck in your head, and perhaps that's what these old guys wanted in the first place.